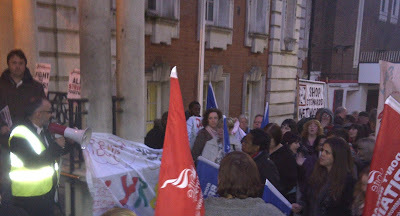 Martin Powell-Davies - teacher trade unionist and socialist: Don't Close Blackheath Bluecoat School! UNITE and NUT banners were waving outside Woolwich Town Hall tonight in a lively protest against the proposed closure of Blackheath Bluecoat School. This lobby follows a tremendous turnout of staff, parents and students at a meeting held in the school earlier this month which was a clear warning to Council Officers of the fight that they will face if they push ahead with their closure plans. At a time when pupil numbers are projected to grow across London, Greenwich Council are proposing the closure of Blackheath Bluecoat with staff losing jobs and pupils being scattered across other local schools. As I said at the Lobby tonight, the NUT will work alongside the school community in opposing this closure - including with strike action if neceessary.